There is a very good reason why Darlene and Bill Freding have no plans for a Rafter F winery on their Saddle Ridge Vineyard on Black Sage Road. They also raise and finish livestock here. That is why they are winemaking clients of Okanagan Crush Pad Winery. It is a concession to the olfactory-challenged among us. So far, Rafter F has released just two wines from their debut 2011 vintage: 83 cases of Pinot Gris and 95 cases of Chardonnay. In the spring, Rafter F will release three reds – a Syrah, a Cabernet Franc and a Cabernet Sauvignon. Also look for more wine production in the future because the Fredings, with 47 acres of vineyard, would like to grow the brand to 3,000 cases. 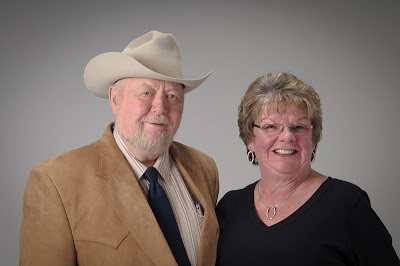 Rafter F is the brand that the family has used in ranching for several generations. Bill Freding, whose master’s degree in agriculture includes expertise in genetics, is a fourth generation rancher. His great-grandfather, John Allison, was the first settler and rancher near what is today called Princeton. Bill and Darlene began their ranching career in the Cariboo, running four different ranches until Bill, in 1988, bought a feedlot south of Oliver that had been in receivership. Here, he could better apply the genetics and the other sciences that he had learned at university. Ultimately, the Fredings have developed a premium beef product which they sell as Okanagan’s Finest Angus Beef. The animals are fed a daily litre of wine for 90 days in the last 90 days of finishing them for beef. Kobe beef is as succulent and tender as it is in part because the animals are finished with sake and beer in their feed. “Why can’t we try it with wine?” Darlene remembers asking. Before we get too far down this path, it should be said that the Fredings did not start making wine to nourish their animals. It is just a coincidence. They grow a lot of corn for animal feed. 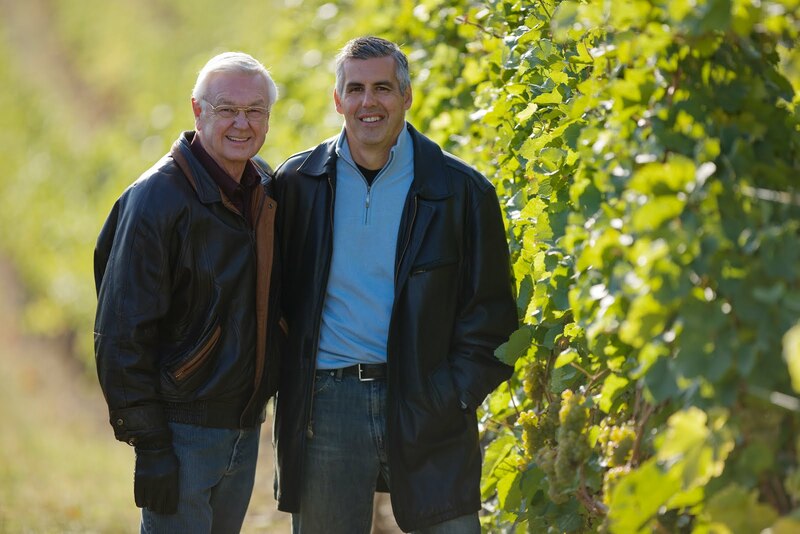 In 1998, with Richard Cleave as their vineyard consultant, they began planting vines in one of the corn fields. Today, they grow Cabernet Sauvignon, Cabernet Franc, Syrah, Merlot, Chardonnay, Viognier and Pinot Gris. For a number of years, fruit from their Saddle Ridge Vineyard was being sold to Road 13 Vineyards. Michael Bartier, now the senior winemaker at Okanagan Crush Pad, was then Road 13’s winemaker. “Last year [in 2011], after Mike Bartier joined the Okanagan Crush Pad team, I decided it would be fun to see what we could do,” Darlene says. She sent OCP the grapes from 2½ acres and had Michael make the initial Rafter F wines. In 2012, she has sent double the quantity of grapes. Clearly, the Fredings are feeling their way cautiously into the wine business. “We just plain, simple, agricultural folk,” she says. Don’t kid yourself. This is a salt of the earth couple that grows good beef and good grapes. Rafter F Pinot Gris 2011 ($21). This wine begins with aromas of citrus and toasty lees. On the palate, there are flavours of green apples and lemon. The texture is flinty and the finish is quite dry. 88. Rafter F Chardonnay 2011 ($21). This unoaked Chardonnay begins with citrus aromas. On the palate, there are flavours of white peach and citrus. It finishes dry, with a mineral note. 87. The new releases from Rocky Creek Winery in the Cowichan Valley this year come with exceeding sophisticated new packaging. Each bottle is embossed with a stylized R and C, so beautifully done that it might be turquoise raven by Bill Reid, set off dramatically against the colour of the wines and the bottles. This is a package that catches the eye on the shelf of the wine store and also looks smart on the table. The other feature that sets the Rocky Creek package apart is the winery’s use of the Zork closure. This is an Australian-developed alternative to screw caps with, arguably, more eye appeal on the bottle. The Zork and the screw cap producers can fight it out amongst themselves which is technically better. Suffice it to say, there is no risk of cork taint. Rocky Creek began using the closure with its table wines several years ago. “We have done a pilot test of the Zork closure over the last three years and learned many challenges associated with this product,” says Linda Holford, one of the winery’s owners. The challenges, mostly with getting bottles made to the right specifications, have been met and the winery believes this is a superior closure. This fall, Rocky Creek became the first winery in North America to start using the Zork closure designed for sparkling wines. The closure comes off (a bit stubbornly) with a satisfying pop. One advantage is that it can be re-applied to preserve the bubbles. By resealing a bottle and keeping it in the fridge, you can actually enjoy a glass or two before dinner each day for at least three days. Here are notes on the wines. They can be purchased in wine stores on Vancouver Island or directly from the winery. Rocky Creek Katherine’s Sparkle Brut 2011 ($23.90 for 85 cases). Here is a delicious bubbly with a fruity aroma, flavours of apples, fine bubbles and a crisp, refreshing finish. It was amazing how quickly we finished the bottle. 90. Rocky Creek Jubilee Brut 2011 ($23.90 for 85 cases). The dark rose blossom hue – the wine is Pinot Noir and Pinot Gris - adds to the festive personality of this wine in the glass. The wine is creamy on the palate, with aromas and flavours of strawberries, but also with a crisp and dry finish. 89. Rocky Creek Pinot Gris 2011 ($17.90 for 265 cases). The wine has a slight bronze blush, indicating that the winemaker gave it skin contact both for colour and flavour. There are aromas of spice, pear and citrus, followed by flavours of citrus and apple. The wine is well balanced and finishes crisply. 88. Rocky Creek Pinot Noir 2010 ($21.90 for a production of 155 cases). The wine begins with aromas of spice and candied cherry. The winery’s notes speak also of a hint of butterscotch. It is all part of the candy in the aroma. On the palate, there are flavours of wild strawberry, cherry and cloves. The wine is delicately light but the typical silky texture of the variety. 88. Rocky Creek On The Mark 2011 ($16.90 for 140 cases). This is a blend of Pinot Noir, Cabernet Foch and Maréchal Foch. The Cab Foch is a red hybrid developed by Valentin Blattner in Switzerland. This wine reflects the difficult vintage on Vancouver Island for reds in 2011 in that the wine is lean and light. It begins with an interesting aroma that reminded me of one of my favourite lunches – a BLT with HP Sauce. I almost made a sandwich to pair with this quaffer. 86. I look forward to tasting this blend from the 2012 vintage, a far riper year on Vancouver Island. Winemaker Mark Holford’s intent with this blend is to create the biggest red he can with what the year gives him. It would be easier to bring in Okanagan grapes but Rocky Creek is one of those island wineries that won’t do that. They are counting on their Cabernet Foch – the vines still are young – to be their primary big red. Rocky Creek Wild Blackberry 2011 ($19.90 for 250 cases of 500 ml bottles). Dark in colour, the wine opens (as it should) with spicy aromas of wild blackberries, leading to aromas of blackberry jam. The texture is fleshy without being heavy. The flavour is naturally sweet, like the berries, and not sticky sweet like Icewine. The back label recommends this with chocolate. It is tasty on its own and would also be an excellent base for cocktails. 90. This summer, Laughing Stock Vineyards was the only winery to be included in Profit magazine’s list of Canada’s 200 fastest growing companies. With a five-year growth rate of 279%, the winery was 159 on the list. Of course, the winery, launched in 2003 when David and Cynthia Enns bought a vineyard on Naramata Road, has grown from a comparatively small base. Even so, the growth rate is sizzling. One of their best marketing ploys has been to sell futures on a portion of their flagship red wine. Customers who put their money down in February for a case or two to be delivered in October currently save about $5 a bottle on Portfolio, now retailing at $42 on release. The futures program and the direct sales to Laughing Stock’s wine club account for about 40% of the winery’s sales. You might think there is a risk in buying a case before tasting the wine. In this instance, the risk is low, given Laughing Stock’s track record for quality. The winery’s sales have grown rapidly because the wines are all well made. Portfolio 2010, just released this month, won a gold medal in the recent Canadian Wine Awards competition. The two previous vintages of Portfolio also won gold medals. Many wineries of Laughing Stock’s size, about 5,000 to 6,000 cases a year, have been content to sell most of the wine in British Columbia, dribbling a little into Alberta. Laughing Stock, on the other hand, has made a deliberate effort to sell its wines as far afield as Ontario. As a result, some of the wines get into the hands of the national wine press and get reviewed nationally. As well, the wines get into the hands of corporate customers. Because of their background in business, David and Cynthia seek out corporate purchasers who use the wines as corporate gifts. The Laughing Stock bottles are tailored to that market. Ticker tape and stock symbols wrap around every bottle of Portfolio, as an example. Here is a heads up for those lucky enough to get either of the current Laughing Stock releases this holiday – or enterprising enough to buy them on your own. Laughing Stock Portfolio 2010 ($42 for 1,675 cases). This is 42% Cabernet Sauvignon, 32% Merlot, 18% Malbec, 6% Cabernet Franc and 1% Petit Verdot. (The remaining 1% got lost on the spreadsheet. )It begins with an exuberant brambly aroma of currants and blackberries mingling with cloves and spice. Generous on the palate, with long ripe tannins,the wine has flavours of black cherry, black currant, vanilla, mocha and spice. This is a complex and satisfying wine that is drinking well now but will age to greater complexity over the next five years. 92. Laughing Stock Chardonnay 2011 ($26 for 314 cases). This wine was fermented and aged seven months in 500-litre oak puncheons, double the size of standard wine barrels. This means the oak is very subtly in the background, delivering a delicate toasty note on the finish but not submerging the lively fruit. The wine begins with buttery tangerine aromas and delivers flavours of tangerine and peach; the winery’s own tasting notes speak of lemon meringue. The fresh, elegant finish lingers. 90. The Belfry Theatre in Victoria is taking a massive financial hit after a fund raiser planned for Sunday was derailed by the Liquor Control and Licensing Branch. If the outrageous ruling that blindsided the Belfry is allowed to stand, all organizations in B.C. that rely on wine auctions to help raise money for charitable causes are in trouble. The now bankrupt Vancouver Playhouse Theatre Company used to get about $300,000 a year from the Vancouver International Wine Festival. Most of that money was raised at Festival’s glittering Bacchanalia which includes the auctioning of donated wine. Just last month, the Bard on the Beach Shakespeare Festival signed on to succeed the Playhouse as the wine festival beneficiary. Here is what happened to the Belfry. The theatre has been raising funds for several years now with an annual wine auction, selling wines donated by wineries and presumably by individuals. It has raised at least $20,000. This year, when Belfry applied for a special occasion license, the LCLB refused. It seems the regulators decided it is illegal to auction donated wines. According to the newspaper, the LCLB in an October 19 letter advised the Belfry that all liquor for such an event "must be purchased from a government liquor store or other appropriate outlet." The LCLB's letter to a consultant used by The Belfrey asserted that "Provincial liquor laws and policies expressly prohibit organizations from soliciting bottles of liquor from individuals to be auctioned for charity." This will come as a great and devastating surprise to the many charities which benefit from donated wine, and have been doing so for years and years. I have sometimes donated wine. Just 10 days, I donated some to a fund raiser at my church’s new school. A few years ago, I donated wine along with a tutored tasting to the CBC’s annual food bank fundraiser. That little donation raised $400 for the food bank. There is not a winery in the province that does not give wine to charity, either to be auctioned or to attract ticket sales for tastings. One example: in the past year, CedarCreek Estate Wine has given away 686 bottles of wine to charity. If you wonder at the exact number, remember that wineries have to account to the tax collectors for virtually ever bottle of their wine. The rule against auctioning donated wine obviously has not been enforced (nor should it have been). Perhaps it is one of those ambiguous rules that moulder happily out of sight until some blue stocking liquor regulator breathes life into it. Hicken, in fact, does not agree with the LCLB’s interpretation of the regulations. “I think they can be interpreted to permit private wine at charitable wine auctions,” he says. The rationale for demanding that charities buy wines at liquor stores is, presumably, so that the government maximizes tax collection. As well, no one is allowed to sell wine unless he or she is licensed. Just try re-selling your wine cellar. One suspects that Rich Coleman, the minister responsible for the LCLB, has also been blindsided by this, given that Coleman has been involved in pushing forward some recent positive changes in liquor regulation. It took pressure from the minister to get the LCLB to come up with a license that permits liquor to be served in movie theatres (on a very restrictive basis). It may also have been the minister that opened the door for patrons to bring their own wine to restaurants. The LCLB now has managed to create a huge mess that will land on the minister’s desk once charities around the province get over their shock. This is another example of how convoluted and antediluvian liquor regulation is in British Columbia. There still are pre-Prohibition rules: for example, the tied house rule that prohibited breweries from owning hotel is still on the books. As a result, at least three wineries have been prevented from selling their wines in offsite lodges and restaurants they owned. The rule came in to stop brewers from monopolizing chains of hotels. There has been no need for that prohibition for at least 75 years. When I pointed that out to a former minister in charge of the LCLB, he agreed with me but he did not have the brass to get the rule dropped. It is as though Col. Donald McGugan’s ghost still stalks the halls in Victoria. The colonel effectively ran what was then called the Liquor Control Board from 1923 to 1969 and he ran it with an authoritarian hand. He was 80 when the government finally managed to get him to retire. This is the text of the October 19, 2012, letter from the Liquor Control and Licensing Branch that outlined the reason for not allowing the Belfry Theatre to auction donated wines. The Liquor Control and Licensing Act requires all holders of a Special Occasion Licence to purchase or obtain their liquor products from the BC Liquor Distribution Branch or an authorized manufacturer or agent. This requirement includes liquor products which may be donated to SOL events for the purposes of consumption at the event or auctioning for charity. LCLB policy supporting the legislation specifically prohibits any individual, business or liquor retailer from providing liquor to SOL holders for any purpose. The SOL application form clearly states that all liquor for the event must be purchased from a Government Liquor Store or other approved outlet. A liquor manufacturer or agent may donate liquor that has been purchased from the Liquor Distribution Branch to an organization holding an SOL as long as that organization is registered as a charity with the Canada Revenue Agency and the event is to raise funds for charity. Manufacturers and agents are not permitted to donate liquor to organizations that are not registered with the Canada Revenue Agency. Only liquor which has been purchased by the SOL holder or liquor which has been donated by a manufacturer or agent may be auctioned at a licensed special occasion to raise funds for a registered charity. It is unfortunate that the Belfry Theatre made plans to accept and auction off wine from individual donors because this is clearly prohibited. Provincial liquor laws and policies expressly prohibit organizations from soliciting bottles of liquor from individuals to be auctioned for charity. The rule applies to anyone who holds a liquor licence. When the matter came to the attention of the branch earlier this week, we contacted the organizers to advise them that they can only accept product from a manufacturer or agent for the purposes of auctioning wine at their event. I am unable to reconsider the decision to allow donated product by individuals because it is specifically prohibited. The government is now trying to save face. Here is the latest press release from Victoria. VICTORIA - Minister of Energy, Mines and Natural Gas Rich Coleman today confirmed the Province will take a "common sense" approach that will allow non-profit organizations to conduct fundraising using gift baskets or similar items that have liquor as one of its components. The law will be permanently clarified by legislative changes at a later date. The approach enables charities and non-profits to conduct certain types of fundraising, such as auctions, using liquor provided it is a part of a gift basket or an equivalent basket of goods. The liquor must have been commercially produced and must not be consumed at the event. Presently, B.C. law requires anyone who sells liquor to be licensed and for the liquor sold under that licence to be purchased from the Liquor Distribution Branch or another approved outlet, such as a B.C. winery. Charities that wish to fundraise using only liquor, without other items as a primary component of a basket, will have to wait until new legislation is in place. For those organizations, a special occasion licence will continue to be required and the liquor will have to be purchased through the Liquor Distribution Branch. "From time to time, we find outdated liquor policies that may have been relevant at a particular time in history but don't work today. Our goal is to get rid of these outdated liquor laws that unnecessarily restrict British Columbians and to regulate alcohol responsibly in the process." Provides flexibility to live-event venues and revises liquor laws for movie theatres. Provides opportunities for restaurant customers that want to bring their own wine into a licensed dining establishment. Police and liquor inspectors now have the ability to issue $575 tickets to people found giving or serving liquor to anyone under the age of 19. Personal Importation of Liquor into B.C. Allows B.C. residents to bring back an unlimited amount of 100 per cent Canadian wine if it is for personal consumption and purchased from a recognized winery in another province, or choose to have it shipped from the winery directly to their home. Allows B.C. residents returning from another Canadian province to bring back on-their-person up to nine litres of wine, three litres of spirits, and a combined total of 25.6 litres of beer, cider or coolers for personal consumption. To learn more about the rules for liquor licensing in the British Columbia, visit: http://www.pssg.gov.bc.ca/lclb/LLinBC/index.htm. 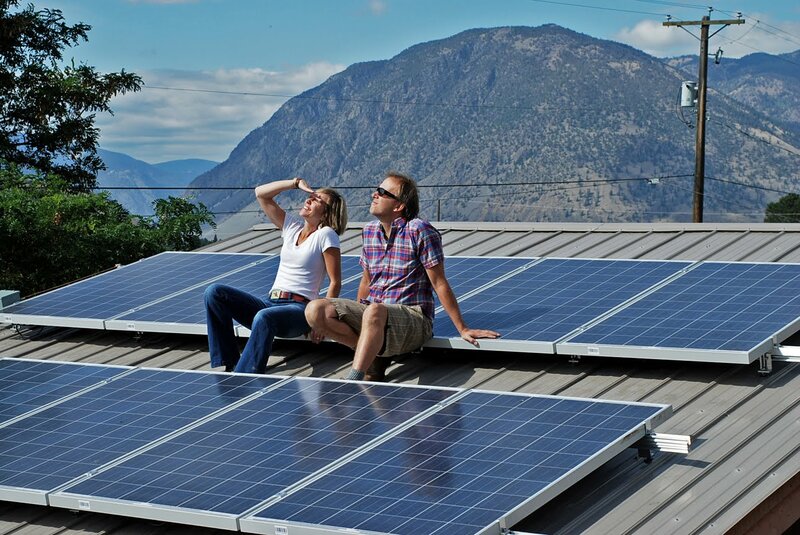 Two British Columbia wineries have taken advantage of incentives under the province’s LiveSmart BC program to fit solar panels and other energy-saving technology. LiveSmart BC is a program that offers free energy audits to small businesses and, if the businesses design a qualifying energy-saving program, offers incentive grants to offset some of the costs. Details are on the LiveSmart website. Businesses should note that program is due to expire in March. The incentives involved are significant. Earlier this month Energy Minister Rich Coleman announced grants totalling $244,415 to a dozen small businesses. Two are wineries. House of Rose Vineyards at Kelowna received a $25,000 grant that has been applied to a range of energy-saving projects at the winery, including upgrading heating with a heat pump, installing a solar hot water system and improving winery insulation. 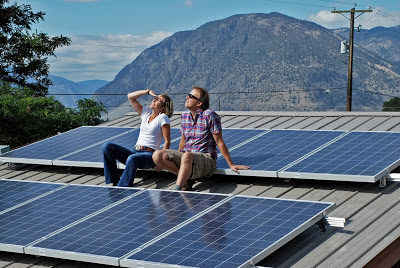 Orofino Vineyards of Cawston installed solar panels and a solar thermal water heating system in August which has virtually taken its tasting room off the grid. The winery received a $16,766 grant which reduced its direct investment in solar to about $6,000. Solar applications are not inexpensive, which explains why so few wineries have adopted the technology despite the huge amount of sunlight in the Okanagan and Similkameen valleys. Orofino owners John and Virginia Weber considered solar when they built their winery in 2004 but held back because the payback then was about 40 years. Orofino has been on the leading edge of energy efficiency since it opened in 2005 in buildings constructed with straw bales, a first among North American wineries. The 21-inch walls have a very high R-60 rating, keeping the winery cool in summer and warm in winter. The wine tasting room, for example, does not need to be air conditioned in summer. Now that solar panels are providing the energy for hot water and for all of the tasting room’s electrical needs, Orofino was often feeding energy into the grid this summer. There are times when this is not so – for example, when the winery is operating its crusher – but most of the time, the power bills here will be miniscule. Both the Webers and House of Rose owners Aura Rose and Wouter van der Hall deserve kudos for their commitment to minimizing the carbon footprint of their wineries. That should generate some sales from wine consumers who prefer to support eco-friendly producers. Orofino’s wines, however, stand on their own feet when it comes to quality. During a September visit to the winery, I was able to taste through the range then on offer. Some are sold out by now. Even so, the scores should give confidence in buying more recent releases. Unfortunately, I did not get to House of Rose this summer. I will make a point of visiting next season. Here are my Orofino notes. Orofino Muscato Frizzante 2011 ($25 for 300 cases and sold out). This is a delightful Prosecco-style sparkling wine made with Muscat grapes. It begins with alluring fruity and floral aromas. On the palate, it is a bowl of tropical fruit with a crisp, refreshing finish. This was the perfect wine for brunch. 90. Orofino Pinot Gris 2011 ($20). This wine has aromas and flavours of citrus, apples and pears, with a crisp and fresh finish. 90. Orofino Riesling 2011 ($20). Here is another winery moving into the top ranks of Riesling in British Columba. This wine begins with aromas of lime and a hint of petrol. On the palate, there are flavours of lime and green apple. The finish is tangy, with bright acidity that is well-balanced with fruit and residual sweetness. 90. Orofino Gamay 2011 ($23). This is fun wine, with aromas of pepper, cherry and cream soda and with juicy cherry flavours. Another great brunch wine. 90. Orofino Red Bridge Merlot 2010 ($25 for 930 cases). There is a cult following for this Merlot, made with grapes from a single vineyard in Kaleden. It is the only Orofino wine not made with Similkameen grapes. A wine with long, ripe tannins, it has aromas and flavours of black currants and chocolate. 90. Orofino Scout Vineyard Syrah 2010 ($29 for 250 cases). This wine, which was aged 15 months in French and American oak barrels, has a profoundly deep violet colour. There are aromas and flavours of blackberry, black cherry, black pepper, vanilla and liquorice. The acidity of 2010 gives brightness to the fruit flavours. The finish is spicy. 91. Orofino Beleza 2009 ($34 and sold out). This is the winery’s flagship Bordeaux blend: 40% Merlot, 30% Cabernet Sauvignon, 20% Petit Verdot and 10% Cabernet Franc. Beleza is Portuguese for beauty. This is a complex red with fine ripe tannins and with aromas and flavours of black currant, blueberry and chocolate. If you have this in your cellar, age it another four or five years. British Columbia’s oldest winery, Calona Vineyards, turned 80 this year, marking the anniversary with a party at the winery that was far too modest, considering the history. Those 80 years are filled with colour, drama and trend-setting wines. Calona’s wines have not always had the respect they deserved. However, with the possible exception of the unsuccessful apple wines that the winery started with, the wines always have been in tune of the consumer palates of the day. The first colourful person in the Calona story was Guiseppe Ghezzi who in 1931 organized a syndicate of Kelowna investors to finance what was originally called Domestic Wines & By-products. That name was changed a few years later. The winery invited consumers to make suggestions and awarded a case of wine to the person who came up with Calona. When the Ghezzi group exhausted its funds in the first year, he turned for help to Kelowna grocer Cap Capozzi, with the result that the Capozzi family usually is credited as founders of the winery. They were not – but without the Capozzis, it is doubtful Calona would have survived, let alone thrive. To help raise more money, Cap brought W.A.C Bennett into the partnership. Bennett, the future premier of British Columbia, was a teetotaller but, as a Calona businessman, he realized that the winery jobs were vital at the time (and still are). The two men travelled through the mining towns of the southern interior, selling shares to raise capital. One trick was staging the arrival of a telegram announcing new wine orders just as the presentation was beginning to potential investors. If there were sceptics in the crowd, they were right. Calona’s sales only got on a sound footing when a Kelowna priest persuaded the Catholic Church to buy sacramental wines from Calona, not from Spain. Bennett also agreed to be the winery’s president. He resigned and sold his shares when he went into politics in 1941. Kelowna car dealer Jack Ladd succeeded him as president, holding that office until he died in 1957. Cap’s three sons took over the business. Joe, the oldest, managed the winery and flew the company plane (he had been a pilot during the Battle of Britain). Herb, the middle brother, parlayed his fame as a football player and general manager of the B.C. Lions to be the occasional ambassador for Calona wines. Tom, the youngest brother, had a talent for sales and was also the company’s president. The brothers ran the business for a decade before selling it to Standard Brands in 1971. Borrowing liberally from the brands at Gallo was creating in California, the brothers had turned Calona into a national brand. Standard Brands updated the Calona portfolio (heavy with fortified berry wines) by adding European-style table wines. The most notable home run was Schloss Laderheim, created in 1977 and for a time the best selling white wine in Canada. The brand is still being made and is now primarily a blend of imported wine. Calona’s ownership eventually ended up with Hueblein Inc., an American conglomerate that had absorbed some of the Standard Brands assets. In 1989, Hueblein sold the winery to International Potter Distilling Corp. of Vancouver. Ownership during the 1990s was a bit chaotic, with control for a time in the hands of Vancouver stock promoter. Potter changed its name in 1995 to Cascadia Brands and control moved to a company in Switzerland. Cascadia partnered with Burrowing Owl Vineyards in developing vineyards on Black Sage Road and financing the Burrowing Owl winery. That partnership eventually ended but not before Calona had launched its highly successful Sandhill Wines. The Sandhill project revealed the remarkable winemaking talents of Howard Soon who had joined Calona in 1980 after five years in the brewing industry. The Sandhill concept was then fairly unique to the Okanagan: all wines are single vineyard wines in order to express terroir in a way that multi-vineyard blends do not. Sandhill solved Calona’s perceived image problem. Thanks to its history, Calona did not have a premium wine image. In fact, the conglomerate owners of the 1970s and 1980s kept creating new labels. Example: the Springhill Vineyards label was introduced in 1984 for a Chablis and a Burgundy but only lasted a few years. Sandhill benefited initially from its association with Burrowing Owl (for a few years, the Sandhill label even sported a little owl). Sandhill now stands on its own feet as a premium brand and a regular award winner. Calona and Sandhill were bought in 2005 by Andrew Peller Ltd. (the Swiss company had gone bankrupt). Today, the sprawling Calona winery in downtown Kelowna makes the Calona, Sandhill and Peller brands, all under the direction of a winemaking team under Howard Soon. Happily, no owner walked away from the Calona name which graces, among other wines, a series of well-made but reasonably priced VQA wines. These include the variety, Sovereign Opal, an exotic Okanagan-developed grape that is exclusive to Calona. If the name had been discontinued, we might never have heard amusing story about the name occasionally told by Greg Capozzi, one of Cap’s grandsons. He was a lad going into Grade Two in a Vancouver school after a summer with his relatives in Kelowna. Asked for an essay on his summer, he wrote that he had been in Calona. When the teacher corrected his spelling, he was indignant and returned to class the next day with a bottle of Calona wine to support his spelling. Richard Kanazawa’s ambition to have wines under his own label, which actually resulted in his departure from two previous employers, has finally been realized with the release of four wines this fall. The wines have been made available in a few Vancouver wine shops and restaurants, including Libations wine store in West Vancouver. Except for the white table wine, production is small. The wines are certainly worth seeking out, not only for their intrinsic quality but for the refreshing beauty of the package. The elegant labels and capsules were designed by Richard’s wife and partner, Jennifer. The signature design element on each label is what the Japanese call a diamond flower. It has special meaning to Richard because his mother had a diamond flower on her kimono. Richard was born in Langley. His first job in the wine industry was delivering wines for Domaine de Chaberton winery. He had studied food technology at the British Columbia Institute of Technology but could did not land a job in a winery cellar. So he headed to Australia in 2002 where Charles Sturt University accepted his BCIT credits. He combined his studies with winery jobs, including with the Simon Gilbert Winery. He returned to Canada in 2004 and was hired by Red Rooster Winery on Naramata Road. He moved to Blasted Church a few years later but not before making a Malbec at Red Rooster that won a Lieutenant Governor’s Award of Excellence. He did four or five vintages at Blasted Church until moving on in 2011 to take over at Lang Vineyards, which was just emerging from bankruptcy. He cleaned up the cellar, reinstalled winemaking equipment, resuscitated the wines and made the 2011 vintage. Then early in 2012, the owner reneged on a prior understanding and decided he would not tolerate Richard making wines as well for the Kanazawa label. Richard has since moved to Bench 1775 Winery, where the owners are in full agreement with him making both their wines and his own wines. One can perhaps understand that a winery owner might feel possessive of his winemaker’s talents. However, winemakers of integrity do not favour their own projects over those of their prime employers but set out to make all the wines competently. A recent announcement by Mike Lang, who succeeded Richard as general manager at Lang Vineyards, speaks volumes about Richard’s integrity in making the wines at Lang. Mike Lang, by the way, is the nephew of Lang Vineyards founder Günther Lang; neither was involved in issues around Richard’s employment. “As many of you know this past weekend marked the start of the Okanagan Wine Festival,” Mike Lang said in a news release recently. “Each year this festival is started with the Okanagan Wine Awards. It is an event where the best wine from the Okanagan is submitted for judging by some of Canada's leading wine experts. The event took place on Thursday September 27th. 2008 Farm Reserve Riesling and Bronze for the 2011 Maréchal Foch. “While we thought this news was great we were blown away when we received the announcement that our 2008 Farm Reserve Riesling had also won Best White Wine. It is an incredible honour to receive these awards and we are truly ecstatic! Clearly, Richard did a fine job in the Lang cellar. And he did a fine job for his own label. Here are notes on the Kanazawa releases. Kanazawa Nomu 2011 ($19.90 for 530 cases). This is a blend of 70% Viognier and 30% Sémillon. The result is a wine with intense aromas and flavours of apricot, peach, pear and banana and with a richness that is quite satisfying on the palate. 90. Kanazawa Ronin 2010 ($29.90 for 110 cases). This is a blend of 88% Merlot, filled out with equal amounts of Cabernet Sauvignon and Petit Verdot. Dark in colour, the wine begins with an appealing aroma of cassis and vanilla. On the palate, there are bright fruit flavours – black currant and black cherry – with chocolate and blackberry on the finish. 90. Kanazawa Raku 2010 ($29.90 for 100 cases). This is a blend of 85% Syrah and 15% Viognier. The grapes were fermented together, a fairly common practice. And while Viognier is a white variety, winemakers have discovered that it stabilizes and perhaps darkens the colour of Syrah as well as lifting the aroma. This is certainly a dark red with aromas that jump from the glass – aromas of vanilla, pepper, red fruit and chocolate. The palate is generous, with flavours of plum, black cherry, fig, pepper and dark chocolate. 91. South Africa has a major wine industry but you would not know it from the number of South African wines listed in the B.C. Liquor Distribution Branch: a mere 85. Perhaps there is another way for British Columbia consumers to get their South African fix from their own wine industry, which now employs three South African winemakers. As well, three or four producers make red wines with Pinotage, the grape variety developed in South Africa about 1925 by crossing Pinot Noir and Cinsault. The latter is a grape grown in the Hermitage area of France and that probably accounts for the Pinotage name. The first South African winemaker in the Okanagan was Garron Elmes, who was hired to launch Lake Breeze Vineyards in 1995. He is still there, having survived four ownership changes, because he is a capable winemaker. He also makes Pinotage every vintage because Lake Breeze was the first Okanagan winery to plant that variety. Less than an acre is planted here and there is no room for more in the vineyard. Excellent Pinotage wines have been released since by Stoneboat Vineyards, The View Winery, Inniskillin Okanagan and Hillside Winery (although the latter two wineries have discontinued this varietal). The other South African winemakers are Bertus Albertyn (at Burrowing Owl and Maverick wineries) and Danny Hattingh (at Saxon Winery). Neither have Pinotage to work with but they are doing their homeland proud with the wines they do make. And that is certainly so for Garron Elmes. Born in 1972 in Capetown, Garron was freshly graduated from Elsenburg College of Agriculture in Capetown when he took the winemaker’s job in the Okanagan. He has since become a Canadian citizen and an award-winning winemaker. Seven Poplars on the Lake Breeze label was inspired by the stately poplars that used to border the driveway to the winery. The trees were removed a few years ago after some had become diseased and were in danger of becoming windfall. On the label, Seven Poplars used to signal the winery’s reserve level wines. Garron does not make a big deal of that because he believes most of his wines now achieve the Seven Poplars level. Lake Breeze Seven Poplars Sauvignon Blanc 2011 ($22). This wine is sold out at the winery but likely still on restaurant wine lists. It begins with aromas of herbs, citrus and fresh grass. On the palate, there are flavours of lime, with a backbone of minerals and with a crisp, tangy finish. 90. Lake Breeze Seven Poplars Chardonnay 2011 ($25). This barrel-fermented Chardonnay is elegant and delicious, starting with appealing aromas of lemon, orange, along with a whiff of toast from the oak. It follows through with flavours of tangerine, apple and toast. There is a creamy richness on the long finish. 90. Lake Breeze Seven Poplars Pinot Noir 2010 ($25). Deep in colour, the wine has aromas of raspberry, cherry and spice which are echoed in the flavours. The youthfully firm texture has begun to evolve toward the variety’s classic sensual palate. 90. Lake Breeze Seven Poplars Pinotage 2009 ($30). This wine is now sold out because the winery, which never makes much, breezed through the last 50 cases during the recent wine festival. No wonder: this is a terrific red from a very good vintage. The colour is dark. Aromas of black currant and boysenberry jam leap from the glass, leading to rich and jammy berry flavours. There is even a hint of fig on the long finish. 92. Lake Breeze Seven Poplars Merlot 2009 ($25). Here is a ripe, full-bodied wine that jumps from the glass with aromas of cassis, mulberry and sweet plums. The texture is concentrated, with flavours of cassis, plums and spicy black currants on the long finish. 91. While the showpiece winery is a few years in the future, 50th Parallel Estate Winery has begun to establish its brand with two white wines and with the planned release (next year) of a Pinot Noir, the wine destined to be the flagship here. The winery, located north of Carr’s Landing and on the east side of Okanagan Lake, made its first small vintage (700 cases) last fall from young vines, in circumstances recalling the early years at Black Hills Estate Winery. Perhaps that is an omen for the future success of 50th Parallel. This fall, with almost 30 acres of vineyard in production, Adrian plans to make about 3,500 cases. He is working in a new building. It is still functional in design because it is the temporary winery and the future tractor shed. But it is large enough for his needs and large enough to accommodate the tasting room that 50th Parallel will open next spring. The design for a gravity-flow winery has been completed, with construction expected to start next year for a 2014 completion. Future plans call for a separate hospitality centre on a site with an especially fine view over the lake. Here are notes on the wines so far. 50th Parallel Gewürztraminer 2011 ($18.90 for 200 cases). This wine is made entirely with estate-grown grapes. Adrian says his objective was to make a white that “promises sweet but finishes dry.” The wine does have sweet notes of grapefruit in the aroma and on the palate, with a crisp kiss of spice on the finish. 90. 50th Parallel Pinot Gris 2011 ($24.90 for 400 cases). This is made with 70% estate-grown grapes and 30% from another north Okanagan vineyard. It has aromas and flavours of pear with a touch of spiciness and with good weight on the palate. The finish is dry. 88. 50th Parallel Pinot Noir 2011 (barrel sample). Made from the estate’s first Pinot Noir harvest, this wine has great promise. It has lovely aromas of cherry and strawberry, with layers of flavour – strawberry, cherry, mocha, spice, and subtle oak. It also has a rich and silky texture that one expects in fine Pinot Noir. Only 100 cases were made, with a proposed price at release of $30 a bottle. 91. Here is the 50th Parallel winery profile from the recent edition of John Schreiner’s Okanagan Wine Tour Guide. Curtis Krouzel’s 10-year search for vineyard property ended here in 2008, four years after he had invested in resort property on the west shore of Okanagan Lake. “As we looked across the lake, we saw this beautiful piece of property that seemed to be sitting predominantly idle,” he remembers. After some research, he discovered the property’s vineyard history. Jordan & Ste-Michelle Cellars, a winery then based in Victoria, bought grapes—mostly French hybrids but also Riesling and Bacchus—from this vineyard in the 1970s. Frank Whitehead, then a viticultural manager for the winery, remembers it as “good dirt.” Ste-Michelle closed after being acquired by Brights Winery in 1981 and the vines were pulled out in 1988. Before Curtis bought the property, he set out weather stations for climate data and analyzed the soils, assuring himself that it really was good dirt. Born in 1975, Curtis grew up in Edmonton, earned a degree in engineering design technology and soon established his own company, designing plants for the oil and gas industry. With parents from the former Czechoslovakia and grandparents active in the Austrian wine industry, Curtis developed a passion for wine at the family table. When they began courting, one of the first things he told Sheri-Lee Turner, now his wife, was that he was going to own a winery in the Okanagan. In three seasons, beginning in 2009, he has planted 11.5 hectares (28.5 acres), including seven clones of Pinot Noir along with Pinot Gris, Gewürztraminer and Riesling. As the project took shape, he recruited a winemaker from New Zealand who would understand cool climate viticulture and Pinot Noir winemaking. “I did not want to poach from the Okanagan,” he explains. With some help from Quails’ Gate winemaker Grant Stanley, he found Adrian Baker, who has a master’s degree in enology from the University of Adelaide and more than a decade’s experience, primarily with Craggy Range Winery, which also has an Okanagan connection. Australian entrepreneur Terry Peabody, who launched Craggy Range in 1997, turned around struggling Western Star Trucks in Kelowna as chief executive from 1990 to 2000. The size and potential of the vineyard transformed 50th Parallel from the $5 million project Curtis once had in mind to a $22 million destination winery designed by Zeidler Partners, a Toronto firm with clients all over the world. Investors have joined Curtis to realize a 30,000-case showcase winery, including underground cellars, visitor accommodation, dining services and a spa. “This is being built to make sure people have a complete wine experience when they come here,” Curtis says. Photo: Ross and Gordon Fitzpatrick. If one wants to follow the history of modern winemaking in British Columbia, the story of CedarCreek Estate Winery is a good example. When the CedarCreek label, now 25 years old, appeared, there were so few wineries that you could tour them all in two days. Today, there are more than 150 producers (and rising) in the Okanagan and Similkameen wine regions. CedarCreek has not only survived the competition; it is, by any measure, a top tier winery. The original winery at the CedarCreek property was called Uniacke Wines. It opened in 1980, named after a distant relative of one of the owners who had been attorney general of Nova Scotia in the 18th Century. That probably was not the best choice for naming an early estate winery in the Okanagan. The property is on Lakeshore Road on the east side the Okanagan Lake, southeast of Kelowna. That street, now lined with vineyards and housing developments, was perceived in the 1980s as lightly travelled road, somewhat remote from Kelowna. That sense of isolation is one reason why Uniacke struggled. Late in 1986 Uniacke was purchased by Ross Fitzpatrick (who subsequently became Senator Fitzpatrick). He had grown up in the Okanagan, the son of a fruit packing plant manager. When he succeeded in business, he began looking for a hobby orchard and he built a splendid house on Lakeshore Road. Uniacke was nearby and had apple trees as well as vines. It was not too long before Fitzpatrick decided wine was more interesting than apples. The winery was renamed CedarCreek in 1987. The property began to turn the corner in 1990 when 12 acres of Okanagan Riesling, De Chaunac and Chasselas were pulled out, to be replaced over the next several years by Pinot Noir, a far better wine grape. In 1994, the Senator bought Greata Ranch, south of Peachland and on the west side of the lake. It was then a derelict property but he remembered it from its heyday as a major orchard. He reasoned that, since peaches once thrived here, vines also would do well. He planted 40 acres, primarily with Pinot Noir, Pinot Gris, Chardonnay and Gewürztraminer. Then, beginning in 1998, CedarCreek hired two seasoned California winemakers in succession and completed a major modernization of the winery. That was followed by the development of two vineyards near Osoyoos, in 2001 and 2006, giving the winery properties that ripen big Bordeaux reds and Syrah. Today, with almost 130 acres of vineyard, CedarCreek is almost self-sufficient in grapes. Winemaker Tom DiBello, the second of the two Californians, put his stamp on the wines over the decade he was there, making elegant Pinot Noir and Chardonnay and complex, long-lived Bordeaux reds. He left in 2010, to be replaced by Darryl Brooker (right), a one-time Australian sailor who came ashore to get a viticulture degree. He has made wine in Australia, New Zealand and Ontario before coming to the Okanagan. In Ontario, he helped launch Flat Rock Cellars and then spent several vintages at Hillebrand Winery, both major producers. He has begun to put his own stamp on the CedarCreek wines, both with subtle style changes (he has a lighter hand with oak than his predecessor) and with new wines. Example: because he has experience making sparkling wine, he is putting together a cuvée for a Pinot Noir-based sparkling wine that will be released in about three years under the Greata Ranch label. Wholly-owned by CedarCreek, Greata Ranch was established as a separate winery in 2003 to make reserve wines tied to a proposed luxury real estate development there. When that development stalled, the reserve program was shut down; only budget-priced wines have been available there for several years. That is changing again. “We are trying to re-invent Greata and give it its own identity,” says Gordon Fitzpatrick, the Senator’s son and CedarCreek’s president. Once again, reserve quality Chardonnay and Pinot Noir will be made there in top years, along with the sparkling wine. CedarCreek’s reserve wines are released under its Platinum label, a term that goes back to when a CedarCreek 1992 Merlot was awarded an unprecedented platinum medal at the Okanagan Wine Festival. The current Platinum wines include Pinot Noir, Chardonnay, Viognier, Syrah and Bordeaux reds. In the 2012 vintage Brooker intends to make a Platinum level Pinot Gris as well. Brooker has been given a winemaking tool not available to his predecessors: two egg-shaped 660-litre concrete fermenters imported from France. He first saw them in France in 2006 and then made Sauvignon Blanc in them in Ontario. In both instances, he was impressed with the quality of the wines that can be produced with them. The CedarCreek portfolio is still a blend of DiBello wines and, starting with the 2010 vintage, Brooker wines. Here are notes on some of the recent releases. CedarCreek Pinot Gris 2011 ($17.90 for 6,100 cases). The wine begins with aromas of citrus. On the palate, there are flavours of citrus fruits mingled with peaches and apples. The finish is crisp. 89. CedarCreek Platinum Viognier 2011 (Sold out). The winery released 479 cases in June. Alas, I never got to taste it until September. It is an outstanding wine, with aromas of orange blossoms and stone fruits. On the palate, there are flavours of spice and apricots, with a rich texture on the palate. 91. CedarCreek Platinum Chardonnay 2010 Block 5 ($29.90 for 357 cases). This wine is made from grapes coming from a select block in the vineyard at the winery. The wine was fermented in barrels from five different French coopers, with a quarter of the wine allowed to undergo wild yeast fermentation. Significantly, no malolactic fermentation was allowed. The result is a wine with a brilliantly pure fruit focus. The grapefruit and marmalade flavours are vibrant and the texture is rich. 91. CedarCreek Platinum Home Block Pinot Noir 2010 ($39.90). This is elegant wine has a good concentration of aromas and flavours of cherry and raspberry. The texture is firm with a promise of the classic silky texture with a little more time in bottle. 91. CedarCreek Tradition 2007 (Sold out). Tradition is the name for the best wine made here each vintage. The winery released 159 cases in July, 2012. It is a blend of 30% Cabernet Sauvignon, 23% Merlot, 23% Syrah, 15% Malbec, 7% Cabernet Franc and 2% Petit Verdot. All of these have knit superbly over five years which included 21 months in French oak barrels. The aromas and flavours display sweet, ripe fruit – black currants, cherries – along with notes of vanilla. The texture is svelte and polished and the finish won’t quit. 92. CedarCreek Platinum “M 2007 ($65). This is CedarCreek’s fortified wine. It began when Ann Sperling, the winemaker here in the early 1990s, began aging a barrel or two of wine in the hot Okanagan sun. Kevin Willemborg, the first California winemaker here, wanted to dump it but the assistant winemaker hid it and talked Tom DiBello into adopting the project. This particular vintage is made with Pinot Blanc. It has lovely nutty and salty notes, very much like as good fino sherry. 90.